The Pyle Disco Jam 2 Stereo Speaker Systems were made to pump up the party. Play your favorite tracks as loud as you want and with style. Disco Jam speakers feature impressive high-power output and flashing DJ lights that will add life to any occasion. Use them at home, on stage or in the auditorium. They're perfect for any get together and will make you feel like a true DJ once the music plays. 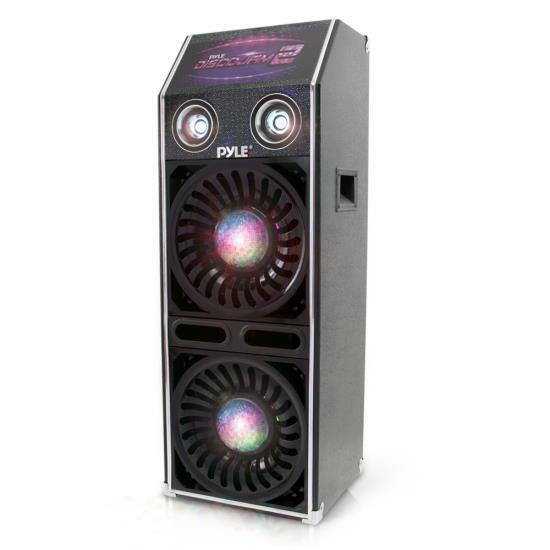 The PSUFM1070P features 1500 watt output, dual 10'' subwoofers, dual 3'' piezo tweeters, ported enclosure for added bass response, and plenty more sound-pounding and party-pumping features. Get the party started with the Disco Jam Speaker Systems! The PSUFM1070P is a passive powered speaker system and works with compatible active powered speakers (*pairs particularly well with the Disco Jam active speaker model number: PSUFM1072BT).